Many real, brick and mortar, shops have Web sites on the Internet now, selling products not only at the real shop, but also on the Web site, too. So low cost and simple solution for a shop are expected. This application shows a solution targeted for a speciality shop with mobile POS. The Web server on the Internet provides back-office services at each shop. At that time, zip formatted data/contents to be updated at a shop are placed in a certain folder of the Web server for each shop. The POS application is the Web based POS application, which means the POS application runs on a Web server on the Internet or at the shop locally, e.g. the built-in Web server at TM-i. Mobile devices, e.g. 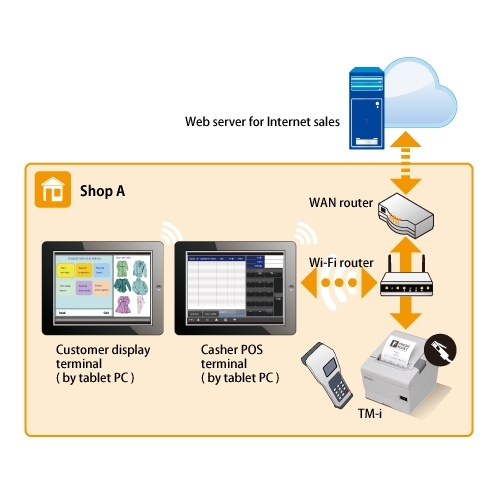 a tablet PC, access the Web based POS application using a browser, then can become the POS terminals. By using a mobile device with TM-i, it can make stylish and small footprint POS system at a shop. Additionally a mobile device can become a customer display to show variety of information to customers at the shop. For example, it is possible to show the Web shopping site, which is running at the Web server on the Internet under HQ management. This expands the business chance at the shop. Using the Web Contents Update function of the TM-i, the new data/contents at the Web server on the Internet are searched on schedule, then automatically downloaded and replaced the existing data/contents on the Web server at the shop. This eases support and maintenance work at a shop.